Adopting Building Information Modeling (BIM) takes time, energy, and resources, creating an unavoidable learning curve. Design decisions must be made early and in great detail which means shifting a large amount of effort to the front end of the project. It is also essential that everyone involved be on the same page. For architects, engineers and construction managers who live in a hard-hat world of urgent issues and compressed schedules, where time is money and problems need to be solved yesterday, adapting to BIM can be wrenching and disruptive. The pre-work associated with BIM in the design phase can have the appearance of slowing things down and creating a sense of inflexibility. But in the pre-fab world, the upfront planning is essential due to the difficultly of making modifications after components been manufactured. Every pre-fab BIM project is a function of two inseparable elements: design and coordination. High-quality building plans are essential. Every detail down to the last sheet of drywall and bucket of paint should be nailed down and proven out in each set of plans. Once the specifications for the pre-fab elements (dimensions, weight, materials, etc.) emerge from the virtual environment, that data is used to create a plan to ensure the manufacture, delivery and installation of the pre-fab elements will occur without a hitch. Integration details and scope clarity between trades are an absolute must which can be detailed and visualized during the BIM planning sessions. If a pre-fab element is part of a renovation installation, it is necessary to identify pre-existing conditions: Do panels need to be removed from the exterior walls? Can teams build around equipment already in place or does it need to be removed? Does piping need to be relocated? Things of that nature. As insurance against unexpected compatibility problems on-site, builders of “plug and play” bathroom and kitchen modules routinely build full-scale mock-ups and prototypes of units to allow essential parties to inspect and offer comments before beginning production, especially on larger projects which typically require mock-up rooms to be built regardless. One vexing pre-fab concern is the incorrect placement of plumbing connection points. To alleviate this problem, large scale pre-fab manufacturers routinely use templates at prefab stations to ensure that outlets and connections are installed in the proper location. When prefabricated modules are subject to code restrictions, such as ADA-compliant bathrooms, it’s a good idea to review plans with local authorities. Pay extra attention to local code requirements which vary widely state-to-state, county-to-county, even city to city. Prefabricated and modular elements should be inspected and tested off-site before delivery. The smallest things – such as water testing bathroom pods – can prevent major problems on-site. Create a move-in path that clearly spells out the delivery methods, timing and logistics necessary for the modules to be delivered and installed on-site quickly and efficiently to insure that all modules arrive at the site exactly when they are needed for installation and in a sequence that does not impact the work on the job site or the overall project schedule. 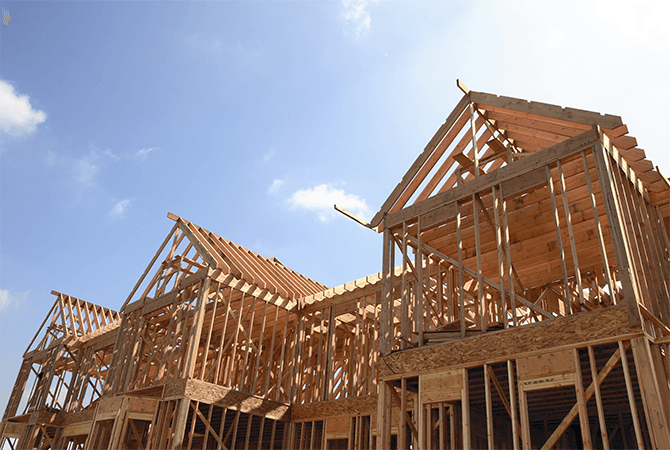 Construction teams sometimes attach radio-frequency identification tags or bar codes to each prefabricated or modular unit to smooth the process. It’s essential to coordinate with all the trades involved to flush out conflicts with the various systems. This is especially important with subcontractors who may not have experience with early collaboration and should happen far in advance of on-site delivery. Double check that equipment and other items necessary to complete your install will be on site and available when your components are delivered. Finally, prefab structures can use more packaging materials in order to withstand the stresses of transportation. Planning for removal and disposal of materials associated with the pre-fab install makes for a clean, safer job-site and goes a long way with the people in charge of the job. See how prefabricated products can help while delivering projects on time, under budget, and more efficiently. The Building Solutions team at CRH is a group of construction industry veterans with diverse backgrounds — from general contractors, architects, and engineers to business owners, developers, and urban planners. We've seen first-hand how technology, the economy, and politics can affect the construction industry. Through our blog and articles on our website, we provide you with our insights to help you understand these influencing factors and plan for the road ahead.